78/92 David Mumpower This has the most forced cameos since Circus of the Stars. 109/126 Kim Hollis Jackie Chan tests my love for him every year. And this time he dragged Steve Coogan into the mess. A movie with a budget that ballooned so big that Paramount dropped out as US distributor, Around the World in 80 Days is currently a movie without a home. It has been expensive; $110 million to date, but in its favor is the fact that the film really does look good. Walden Media, the production company that was previously responsible for the family gem Holes and is developing a big screen adaptation of C.S. Lewis’ The Lion, the Witch and the Wardrobe is behind this re-imagining of Jules Verne’s 19th century novel. The film has a cast so good that it almost defies belief. Jackie Chan will play the central role of the thief Passepartout, putting him in stark contrast to the heroic character he portrays on the WB cartoon Jackie Chan Adventures. Passepartout steals an invaluable jade Buddha statue, forcing him to find refuge in the form of adventurer, inventor, and general eccentric Phileas Fogg (Steve Coogan, who drew critical acclaim in 2002’s 24 Hour Party People), who has bet several members of his Gentlemen’s Club that he can make it around the world in 80 days. To do so, Fogg will use a variety of forms of transportation, including hot air balloon, train, boat, and even elephant. As they travel, Passepartout defends his newfound friend from many dangers, including a detective who thinks that the adventurer robbed a major bank just before he left. This updated version of the Verne novel is directed by Frank Coraci (The Waterboy, The Wedding Singer) and has a number of outstanding performers appearing in supporting and cameo roles. Kathy Bates will play Queen Victoria, while recent Academy Award-winner Jim Broadbent is onboard as Lord Kelvin. 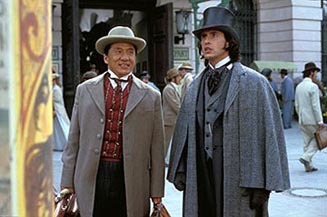 Other featured actors include John Cleese, Chan’s childhood friend Sammo Hung, Johnny Knoxville, Rob Schneider, Arnold Schwarzenegger, and Luke and Owen Wilson as the Wright Brothers.